Driving down the TransCanada Highway from Thunder Bay to Sioux Lookout, Jenny Pert, a native language teacher at Sioux Mountain Public School, was approaching Ignace when she spotted a group of hunters skinning a moose. She stopped and told them she wanted to make a school drum and wondered if she could use their moose hide. Jenny’s skills of persuasion and the hunters’ act of generosity resulted in a gift of not just one, but two moose hides! 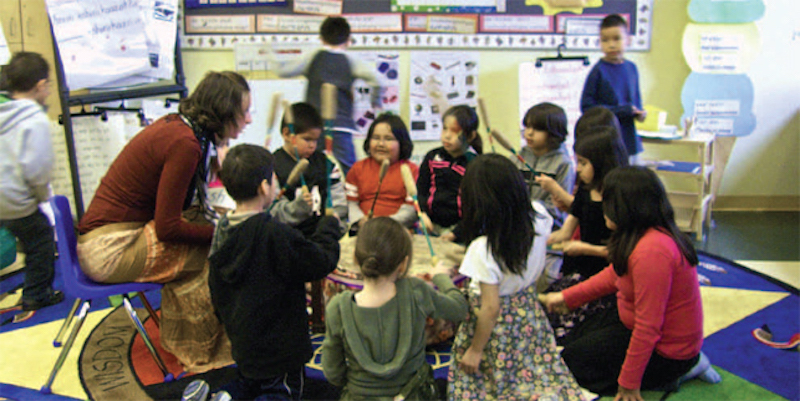 Jenny and the “Danny” school team began their work by offering tobacco to many people in the community and asking local elders and community members for guidance in treating the moose hides and making a large school drum. Local elders showed Jenny and her students how native peoples traditionally scraped the fleshy side of the moose hide and used ashes to create lye to loosen the coarse hair on the other side of the hide. During the fall, Elder Ralph Johnson worked with students in all of Jenny’s native language classes at Sioux Mountain to model and share the teachings with them. With the scraping process still unfinished , the colder temperatures of the approaching winter presented new challenges. Darren Lentz, a teacher at Queen Elizabeth High School, showed the students how to scrape the frozen hair from the hide. The students showed pride and determination as they worked tirelessly, knowing they were getting closer to having their drum. With the raw hide finished, Jenny again offered tobacco to a community Anishnaabe member, Victor Lyon, and asked him to help build the drum. Victor accepted and began building the drum while teaching students how to make individual drum sticks. The drum was completed in four days. When Victor said the drum was ready to be feasted, a pow wow was planned. Invitations went out quickly to the community, while the school staff worked with students in every classroom to prepare hundreds of handmade gifts — including beautifully painted feathers — for the drum celebration. The day of the pow wow was truly an historic event in Sioux Mountain. From the principal’s window the other day, we could see three boys in the kindergarten playground area who had taken a box and tipped it upside down on the ground. They each had a stick in one hand and were drumming on the box. Their faces bore an expression of real pride as they managed to keep the beat together. The heartbeat of the Mother Earth and the pride among our students are alive and well at Sioux Mountain Public School. Gichi Miigwech to the Sioux Mountain Public School Community and to the ETFO Poverty and Education Project. Christina Saunders encourages all members to commemorate Treaties Recognition Week. Presenting an overview of treaties and treaty issues, Saunders offers resources to help teach treaty recognition and land acknowledgement to our students.